Here a treat, there a treat…everywhere a treat, treat! | Dog Notes Inc Training Blog and more! Is your Pug seriously starting to resemble a sumo wrestler? Has your Greyhound lost her “girlish” figure and in desperate need of Spanx? Has your Lab been “snorting and grunting” around the house? How long has he been affectionately known as “Porky”? 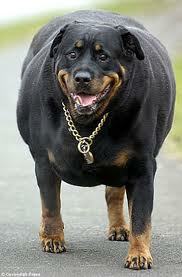 I s Y o u r D o g G o i n g T o B e t h e N e x t “B i g g e s t L o s e r” ? Thirty years ago, we were the proud “parents” of two Dobermans and a Cairn Terrier. The terrier was about one-quarter the size of the Dobes and that half-cup of kibble barely covered the bottom of his bowl. It just never appeared to be enough but I faithfully fed the proper amount every day. To help me understand what was going on, he asked us to run an experiment for a week; recommending we keep track of everything the dog ate during the course of a day. Not just by writing it down…he wanted us to actually see what he was consuming. Example: Dog gets 1/2 cup of food, and 1/2 cup goes into the “experiment” dish. The dog gets a treat, a treat goes into the “experiment” dish, etc. Everyone feeding the dog had to participate. After 2 days, I understood how his nickname had changed from “Little Stud Muffin” to “Jelly Roll” over the course of a few months. He was practically eating Doberman rations! My in-laws were visiting from out-of-state and the little guy was their favorite. (I guess many don’t consider Dobermans to be “cute and cuddly”!) She would toss tidbits while cooking and he always made sure his plate had some leftovers for the lad. We also had the weekly visits to my grandparent’s house. The little rascal would literally run through the door and sit in front of the fridge and stare. He knew his diligence would eventually pay off and the door would magically open. I should have payed more attention. Never thought this could happen…not in a million years. How did I not know? I should have stopped this before it went too far! I’ve heard of his kind and know they’re out there. They are the ones that with a simple tilt of their head to one side or the other transforms them into…a bologna whisperer!! The solution was simple at that time. JUST DON’T FEED HIM SO MUCH! It starts to add up quickly. 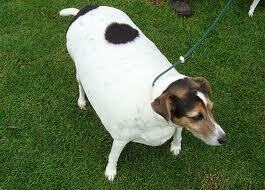 Luckily, it was summertime during his “doggy fat farm boot camp” and within a month, his waistline returned. During the reduction phase, I fed him the same amount of his regular kibble but without the “added attractions”. The few treats he received were broken in half to go twice as far. Quite often, we simply used pieces of his food for treats. The in-laws went back to Florida and we compromised with Gramps. We allowed one piece of bologna about the size of a thumbnail…(or so they promised…) Eventually, he was weaned off bologna but he still stared intently at the door of the fridge. We decided to let him think he still had his magical powers and he was just as happy to chase the carrots we left for him in their fridge. Sometimes we just forget about using commonsense. 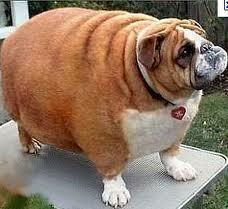 Our dogs will gain weight if they eat more than they burn off. Same with us. We may not think we eat too much, or eat too much of the wrong foods but the love handles, muffin tops and bat flaps for arms are a good indication that the cookies, jelly beans and sodas have found a home. 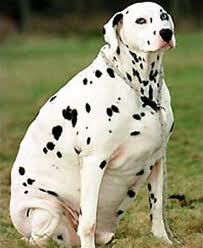 Quite often, our four-footed friends might need a little jumpstart in the early stages of “doggie fat farm boot camp”. Quite a number of years ago, I was fostering another Bologna Whisperer. She was tall for a Sheltie and needed to lose about 12 pounds. (Right here is a good case against total treat training.) At the tender age of three, she had 6 owners prior to our fostering her and they thought the only way for her to “perform” was to reward her with treats. 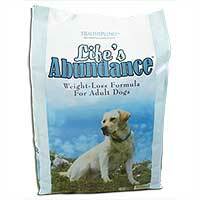 I was familiar with the Life’s Abundance weight loss formula food at the time and decided to order it for her. Within about 6 weeks, she lost her excess baggage. When we decided to give her a treat, it was a piece of her regular food. Her rewards were simply telling her she was a good girl. I recently wanted to take a few pounds off of the Greyhound this past long, cold winter. 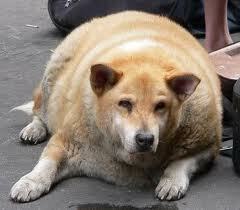 So, for about a month, with great success, I switched her food to Life’s Abundance Weight Loss Formula for adult dogs. Greyhounds generally have a “to die for” metabolism and while I kept her on the reduction food for about a month, she had actually slimmed down and lost the “belly fat” within about 10 days. She was able to eat the same amount of kibble but this formula has 30% fewer calories so she was none the wiser. In addition, I was confident feeding this food as it is formulated by Dr. Jane Bicks, a holistic veterinarian. She is now back to her regular diet. She loved the weight loss food and it agreed with her system from day one . Oh, and did I mention you can order online and that it’s shipped via UPS directly to your door? An “auto-ship” option is also available to ensure you never run out and it offers a price savings, as well. They carry functional treats and chews the dogs tell me are delicious, as well. My heart goes out to these dogs. These photos are not meant to be degrading, humorous or entertaining-just a harsh reality. If your dog resembles the bulldog in the above photo or any of them below-SEE YOUR VET IMMEDIATELY! 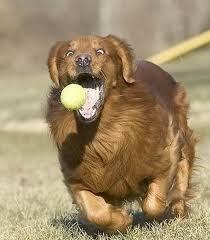 One of the photos shows the overweight Golden Retriever chasing a tennis ball. This dog should not be subject to this type of exercise at this time. The terrier I was referring to earlier in the post only needed to lose a few pounds but a few pounds on a 20# dog is actually quite a bit. My Greyhound should weight between 68# and 72# and she was about 75# when we put her on the Life’s Abundance weight reduction food. We fed her the same amount but the food has 30% less calories and she shed the weight very quickly-in the middle of winter! 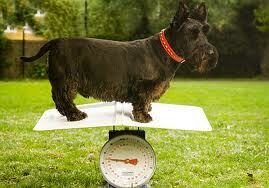 You do not need a scale to know your dog is overweight. If their waistline starts disappearing or you see a tummy bulge when they are laying on their side or you do not see their tummies tucked in any longer when standing-then it’s time to do something. Can you “easily” feel their ribs? (No cheating!) Remember…you probably see the dog everyday and hopefully, someone that hasn’t seen the dog in a while will honestly say something if the dog is becoming a “portly” pooch. Don’t wait until your dog looks like some of those below. 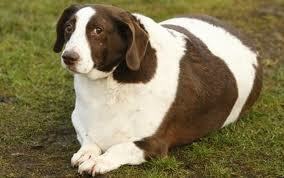 Most of these dogs should have been on a reduction diet over 20# ago. It’s a very SERIOUS matter as years are being taken off their lives. Always pick up after your pets! Content copyright 2010 . All rights reserved. This entry was posted in Healthy Dog Tips, Uncategorized and tagged antioxidant treats for dogs, arthritis formula for dogs, best weight loss dog food, biggest loser dog, bologna whisperer, buy dog food online, chicken and crab canned dog foods, chubby dog food, delicious dog treats, dental treats for dogs, dog diet food, dog food comparison, dog food delivered to home, dog food for fat dogs, dog food for overweight dogs, dog food for weight loss, dog food gift certificates, dog food healthy, dog food online, dog food recipes, dog food shipped to you, dog food weight loss, dog gift ideas, dog healthy diet, dog treats that clean teeth, dog vitamins, doggie boot camp, doggie fat farm, doggy boot camp, downward facing dog, downward facing dogs, dr. jane bicks, dry dog and cat food, ear care formula for dogs, ear cleaner for dogs, environmentally friendly cleaning products and deodorizers, fat dog food, fat dog pictures, fish oil, functional treats, gentle ear cleaner for dogs, healthy canned dog and cat food, healthy dog chews, healthy dog food delivered to your home, healthy food for cats, healthy pet net, healthy pet net food for cats, healthy pork chews, healthy training treats for dogs, healthy treats, healthy treats for cats, healthy vitamins for dogs, healthy weight loss foods for pets, heart shaped dog treats, herbal dog spray, high quality dog food, how do I know if dog is overweight, iams weight loss formula for pets, jane bicks, jane bicks dvm, jane bicks foundation, jane bicks veterinarian, life's abundance pet food, lifes abundance food for cats, low calorie dog food, low calorie dog foods, low calorie dog treats, nice smelling shampoo for dogs, obese dogs, order dog food online, overweight dog diet, pet insurance, porkhide bones for dogs, porky puffs for dogs, reduced calorie dog food, restricted diets for dogs, revitalizing clay mask, revitalizing shampoo for dogs, sealogix fish oils, skin and coat vitamins for dogs, soothing mist dog spray, taking years off of dog's life, turkey and shrimp canned dog food, veterinarian formulated dog and cat pet foods, weight control dog food, weight loss dog food, weight loss pet foods, weight management dog food, weight reduction diet for dogs, what are good ingredients for dog and cat food, what is really in your pet's food, yoga dogs. Bookmark the permalink. 2 Responses to Here a treat, there a treat…everywhere a treat, treat! Thanks for sharing this to us. 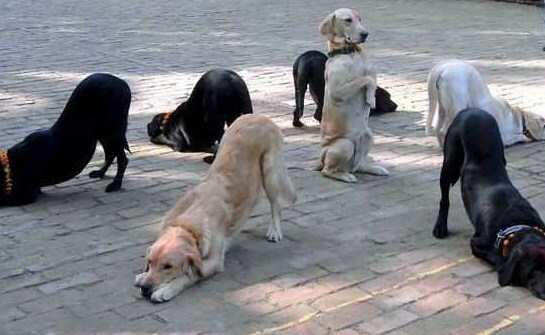 This adds more ideas on how to train a dog.